Although, Dr Pezhman was unavailable today, the substitute Dr Knee was excellent. Her bedside manner was amazing and professionalabove and beyond. Although, Dr Pezhman was unavailable today, the substitute Dr Knee was excellent. Her bedside manner was amazing and professional above and beyond. I had a great experience at Forest Hills Vision! My doctor was courteous, professional, had great bedside manner. In fact,everyone at this place did. I was seen right away at my appointment time. I’ll definitely be back. I had a great experience at Forest Hills Vision! My doctor was courteous, professional, had great bedside manner. In fact, everyone at this place did. I was seen right away atmy appointment time. I’ll definitely be back. 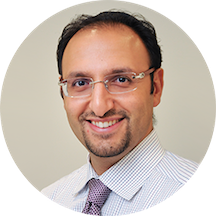 Dr. Hourizadeh completed his undergraduate studies at SUNY Stonybrook, and received his Doctorate of Optometry from SUNY State College of Optometry. He is the founder of Corona Vision, which started as a small one room office in Rego Park in 2006 and has grown into five offices, open six days a week, and providing eyecare needs to families throughout Queens. Dr. H completed an externship in adolescent and pediatric eye care, and sees patients of all ages. He also specializes in the diagnosis and treatment of Glaucoma, Keratoconus, Amblyopia, Strabismus, and many more. The doctor was very professional and attentive to my needs and concerns.. Pleasant and knowledgeable staff. I enjoyed my visit and would recommend them. Doctor was very good and professional. Staff is professional and Doctor is excellent. very professional, friendly and informative. My son saw another Doctor there and he was very helpful. The entire office is really nice and helpful. We didn't wait long at all. The Staff was friendly and professional. What I really liked was the staff and Dr. not attempting to up sell me. The Sales Representative listened to what my needs and wants were and offered me just that..
Place is nice spacious office a lot glasses selection he was very professional. Only downfall imo is I don't feel doctor was too informative. Kind had ask a lot questions to get the info. It was a great visit. Short wait and brief form to fill out. Everyone there was great and very patient. Very nice place and very clean. I really liked the way the doctor treated my child; he did his job very well. He was very kind and and very responsible. Really nice and reassuring. I might have been overreacting to a vision abnormality, but he took my concern seriously and made me feel much better about the whole thing. Thank you Dr. Hourizadeh! I was very impressed with the immediate & very courteous service provided by the whole team at Corona Vision, Yonkers. They were very professional & helpful wit their advise. I would highly recommend them. very pleasant visit. doctor is personable and seems very qualified - aka you as a patient don't feel you are just being rushed through. Really friendly and knowledgable. Only waited maybe 5 minutes for my appointment, which was wonderful! Amaze! Great with my daughter Jessie, when she was fussy with the dilation. Extremely patient with my child. Terrific visit. Both the Doctor and his staff were friendly, professional and accommodation. I went to the doctor for a standard eye exam, to get a prescription for eyeglasses and perhaps to get frames. He spend a lot of time explainingthings to me, and never made me feel rushed. I also liked the fact that, when he and his staff were showing me frames, they never pushed on me the expensive frames or frames that would have cost beyond what my insurance would have covered. Also, it was great that the team gave me their honest opinion as to which frames looked good vs. bad on me. Ended up buying a pair of frames that I love, and look forward to going back to pick them up. Highly recommend. Dr. Hourizadeh and his team are very nice. he displayed an excellent bedside manner and thorough in his approach. Long wait time - almost an hour from time of appointment. Very knowledgeable and concerned with eye health. Seen promptly at scheduled appointment time. The staff at the store were also great, very friendly and attentive.